Lush green mountain ranges for miles in every direction – this was the first glimpse I got of Honduras as our flight was descending into Tegucigalpa. The natural beauty of this country only became more surreal the further we drove to our new home of Juticalpa. But it’s not just Mother Nature that adds to the beauty of this country, the vibrant Honduran culture is what gives this country life. On my flight here I sat next to a couple from San Pedro Sula. We had been making small talk, and they asked, “So where are you going in Honduras?” I think they were expecting me to say Roatán or one of the touristy coastal towns, but when I had told them I was traveling to Juticalpa to tutor English they were a bit taken aback. Their eyes widened and said, “Oh! You’re going to the sticks!” followed by a few laughs of disbelief. It is true. 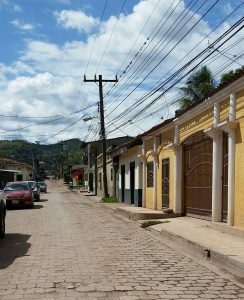 Olancho is like the Wild West of Honduras. Where it is common to see people riding horses and bicycles next to buses and cars barreling down pot-hole filled roads. Horses and cows appear to meander the countryside and the outskirts of town, while it is common to encounter at least three stray dogs no matter where you are going. Fireworks and gunshots go off frequently, but let me assure you that the gunshots are typically of no real danger, (again, think Wild West). The pace of life and work here are a bit different than what I am used to in the United States, so it has taken some time to adjust. Flexibility, optimism, and patience are three essential virtues that have helped me through my first few weeks here in Juticalpa, and I know they will continue to be of importance during the rest of my time in Honduras as well as throughout my life. I couldn’t be happier with my decision to volunteer with the Olancho Aid Foundation. The people and culture of Olancho have already made an impact on me, and I feel as though I have a real opportunity to make a difference during my time here.